The Wayne Business Association commissioned an impact study of the Business District in 2018 to reflect the benefits that the Township derives from businesses in Wayne. Please take a moment to read. With this study, we hope to garner more support for maintaining the down town district. This includes tree scapes, beautification of the major corners, repaving parking lots and general maintenance on a consistent basis. We would greatly appreciate t eh support of business owners, landlords and the community at large in expressing support of this with their commissioners and by speaking in public comment at the Radnor BOC meetings the 2nd and 4th Mondays of the month. Small Businesses are vital to our Main Line Community. We love supporting them and connecting them! Join the WBA , Bryn Mawr Business Association and the Ardmore Initiative as we are hosted by the Villanova University for a panel discussion on Small Business. Celebrate 80 years with the WBA! Enjoy our Annual Member Meeting and Awards event. Brief Description: Looking for ways to help our community? Throughout the month of April our agency is donating $10 for every quote we complete to Home of the Sparrow. Call us or stop by the office today! Brief Description: Using archaeology as a framework to explore personal historical materials. Brief Description: Small Businesses are vital to our Main Line Community. We love supporting them and connecting them! 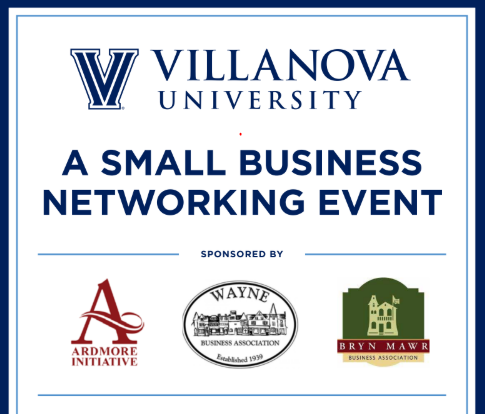 Join the WBA , Bryn Mawr Business Association and the Ardmore Initiative as we are hosted by the Villanova University for a panel discussion on Small Business. Brief Description: Join DMAX Foundation on April 24, 2019 at The Shipley School in Bryn Mawr for an empowering presentation about mental health and resilience, hope, and love. Brief Description: Celebrate 80 years with the WBA! Enjoy our Annual Member Meeting and Awards event. Brief Description: Join your neighbors in saving lives while also supporting Radnor Fire Company/Radnor Ambulance and the Wayne Senior Center! For every unit of blood collected, Carol's family will make donations to both organizations; if the blood drive collection surpasses last year's total of 168 units, these donations will be doubled. All donors will receive a gift bag, free entry into prize drawings, and tasty treats. Schedule your lifesaving donation appointment at www.chablooddrive.org, or call 1-800-RED-CROSS and mention sponsor code "CHAMemorial." Brief Description: Author Thom Nickels presents some of Philadelphia & The Main Line’s most iconic homes and the stories behind them. Title of Event: Exclusive Skincare Event: Featuring Vivace Microneedling and Radio Frequency At Currie Hair, Skin and Nails! Brief Description: The Currie Day Spa at Wayne is excited to invite you, on Thursday May 9th from 4:00 pm to 7:00 pm, to an advanced skincare event with Vivace Experience! Vivace is the newest generation of microneedling with radio frequency and LED therapy. This non-surgical treatment for contouring and tightening the face, neck and body stimulates the production of collagen, and reduces fine lines, wrinkles and acne scarring using the most revolutionary, best-in-class microneedling RF device. Please join us for an evening with cocktails and light fare food, meet our Vivace professional team, and experience the Vivace for yourself! Receive a target area treatment for $199 (reg. $400 and take advantage of our special series pricing that night only. Reserve your spot today by calling Currie Wayne at 610-225-2415! *Non-refundable deposit of $199 required at time of booking and can be applied to series pricing that night only. Brief Description: Network with fellow members at our monthly May Meeting hosted by Day Spa by Zsuzsanna. Brief Description: Think you know Radnor? Let Radnor Historical Society, sponsored by Pennsylvania Trust, guide you on a 90-minute tour exploring many intriguing, historical corners of the township we call home. Brief Description: Discover the history that is hidden all around us! Hidden throughout Eastern Pennsylvania are ghost towns, forgotten cemeteries, and other little-known historical places. The heart of shopping on the Main Line, stroll around town and enjoy a wide selection of Fashion boutiques and merchants. With more than a dozen restaurants and bars located along Restaurant Row there is something for all palates. From a quaint bed and breakfast to the historical landmark Wayne Hotel, Wayne offers you an escape from the ordinary lodgings.